I get the feeling that you like “Dark. Deep. Depressing. Funny. Haunting. Sad. Scary.”. Placed an order for it thro’ Flipkart. I remember now that I should have consulted you on the cheapest buy. I hope you got it at the cheapest 🙂 (Rs.252 is the best price on Flipkart). Let me know what you felt after reading the book. I got it at 239/- with free delivery, but it’ll reach me only on July 22! Beginner’s luck. You got it at the lowest price. Long wait, but worth it. While on the subject of “Dark. Deep. Depressing. Funny. Haunting. Sad. Scary.” novels, I am reminded of one that was funny-sad, depressing-elevating and definitely haunting. It was kind of “historical” in that it is set in a specific period where well documented events have taken place, and some of these events touch the lives of the characters. The title in someways reflects my observation on the novel. Guess the title. Well Indian author was factually incorrect – Author is of Indian origin. Just one more guess. Midnight’s Children? I read that ages ago, didn’t hit me in any way back then. OK it is Rohinton Mistry’s “A Fine Balance”. A recommended read, if you haven’t read it yet. Ah. I’ve only read Such a Long Journey. A Fine Balance was going to be my next book. 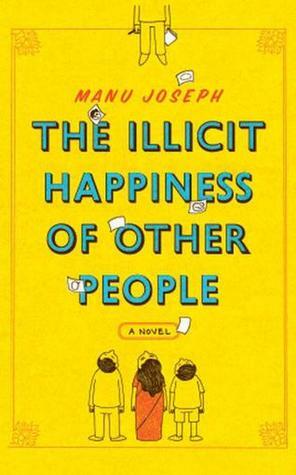 Actually, I picked that up first, then chose to read Illicit Happiness instead. But let me read some lighter stuff before picking up another dark one. Yes, yes, you need to space out your dark novels. Try a PGW – any from the Psmith series. I was re-reading this review just a moment ago – it gave me goose-bumps. Having read the book now, if found that the second and 3rd paragraph of your post so elegantly captures the essence of this book and the first the feeling with which one is left. I loved the book. I guess that your review of it is just as good in recreating the ambiance. PS: Jobless? yes, perhaps I am.